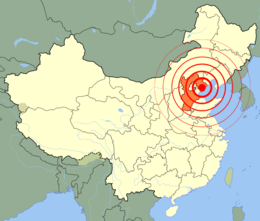 ^ Historic Earthquakes Tangshan, China 1976 July 27 UTC (local time July 28) Magnitude 7.5. （原始内容存档于2011-08-09）. ^ 7.0 7.1 王瓒玮. 唐山大地震40年：从死亡人数到天灾还是人祸仍是一地鸡毛. 界面. 2016-07-28 [2019-02-06]. ^ Spignesi (2005， pp. 47–48) quotes from a geocities.com webpage of "Dr. George" that is no longer available. Spignesi quotes Pararas-Carayannis as saying that, in the 1556 earthquake, "in some counties the average death toll was 60 percent of the total population", and that it was reasonable to expect a similar proportion of deaths at Tangshan since the magnitudes were similar (assuming that the intensity of ground-shaking was also similar), and "since construction standards for this rural area had not changed significantly" （Spignesi 2005，pp.47–48）. However, that premise is false: the large death toll in Shaanxi (Shensi) has been attributed to the yaodong style of construction peculiar to that region, where rooms, and entire buildings, are carved out of a thick layer of soft sediments (loess) that blankets the region, leaving walls of weak material similar to adobe to support the roof （Golany 1992，pp.7,1）. ^ The China Earthquake of 1976, [18 July 2018] . ^ UPI: Pacific Stars and Stripes, 7 August 1976, p. 11. ^ UPI: reported in The Redlands (California) Daily Facts, 5 January 1977, p. 5. ^ Quake Toll in China Put at 655,000 In Report Said to Come From Area. The New York Times. 1977-01-05 [2019-02-06]. ^ 唐山地震死亡人数是如何公布的. 人民网. 2016-07-28 [2019-02-06]. ^ 林泉. 地球的震撼. 中国地震出版社. 1982. ^ 唐山地震纪念墙上的新名字：每个名字，都是一块墓碑. 新华网. 2017-07-29 [2019-02-06]. ^ Palmer, p. 189, quoting from Jiaqi Yan,Gao Gao translated and edited by D.W.Y. Kwok., Turbulent Decade a History of the Cultural Revolution (Honolulu: University of Hawai'i Press, 1996), p. 514. Chen, Yong; Tsoi, Kam-Ling; Chen, Feibi; Gao, Zhenhuan; Zou, Qijia; Chen, Zhangli (编), The Great Tangshan Earthquake of 1976: An Anatomy of Disaster, Oxford: Pergamon Press: 153, 1988, ISBN 978-0080348759, LCCN 88005916 . Spignesi, Stephen J., Chapter 15: The 1976 Tangshan, China, Earthquake, Catastrophe! : The 100 Greatest Disasters of All Time, 2005, ISBN 978-0-8065-2558-7 . Golany, Gideon S., Chinese Earth-Sheltered Dwellings: Indigenous Lessons for Modern Urban Design, University of Hawaii Press, 1992, ISBN 978-0-8248-1369-7 .